Last Wednesday was generally wet and miserable, I had to drive 45 minutes to hospital from work in the middle of the day for a 15 minute appointment, and had various dull things to deal with at work both before and after that too. Finally the evening rolled around and with it a dinner date with my friend Karina at Food for Friends (who were very good about me pushing back our reservation by half an hour at relatively short notice!) which made the day ten times better! Now Karina is a vegetarian, and has been since long before I’ve known her. She’s also lived in Brighton for as long as (if not longer!) than me and once we’d got in, sat down and been offered drinks she told me she’d never eaten there before! I was shocked, as I eat there at least two or three times a year and am not even a vegetarian (though my mum, and dad and his wife all are hence the frequent trips when they’re in town!) 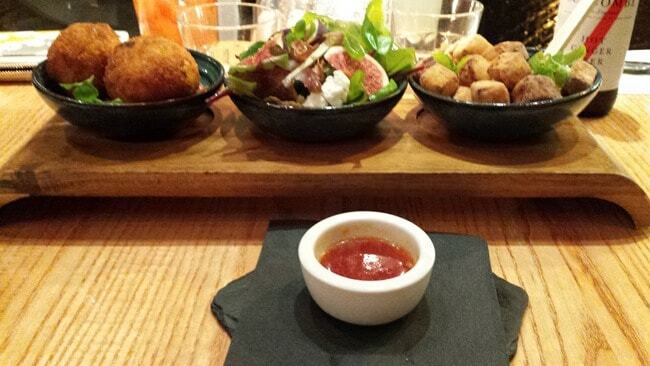 We decided to try out a selection of the mezze menu for starters, and after a bit of deliberation went for the Mirin marinated crispy tofu with sweet-chilli sauce, the Fresh fig, basil & ricotta salad with a honey mustard dressing, and the Goat’s cheese, sweet potato, and basil arancini served with relish. 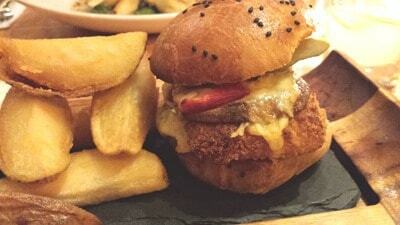 The arrancini were so delicious, with a crispy outer gorgeously creamy inside. From memory I think a version of these used to be on the main menu, so ordering two of the starter portions would make an idea main course. Each mezze choice is £4.50 each, or 3 for £12, so if you’re feeling particularly indecisive or just popping in for a light lunch with friends or colleagues then grabbing a selection to pick at would be ideal as it’s served from midday! 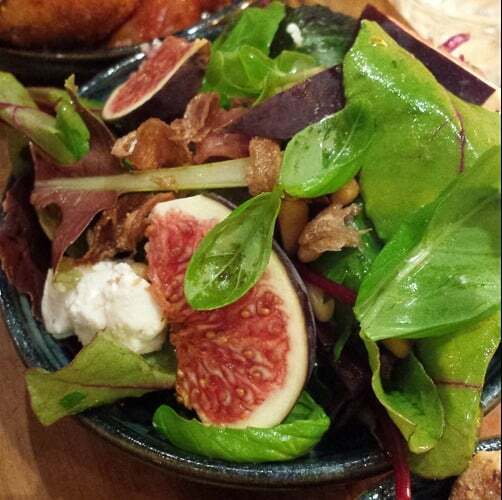 The Salad was amazing too, although I can never remember if you’re meant to eat the skin of a fig or not (I did!) but the ricotta and pine nuts were delicious additions. The crispy tofu was nice, but could have done with a little more flavour I think. 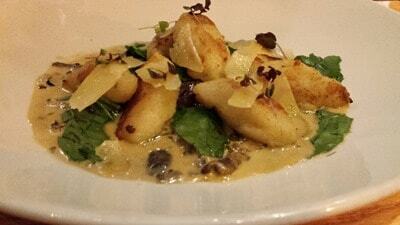 Karina had the Roast potato Gnocchi with wild mushrooms and spinach in a tarragon and cream sauce. I tried half a gnocchi and it was awesome, perfectly cooked. 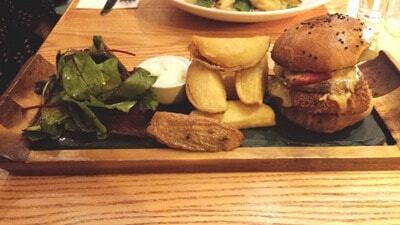 The sauce was smooth and the tarragon didn’t overpower the other flavours either which I’ve experienced elsewhere. The piece de resistance was the assiette of Chocolate, which is a sharing dish with Chocolate meringue and chilli chocolate crisps, chocolate brownie, mousse white chocolate ice cream and molten chocolate pudding. 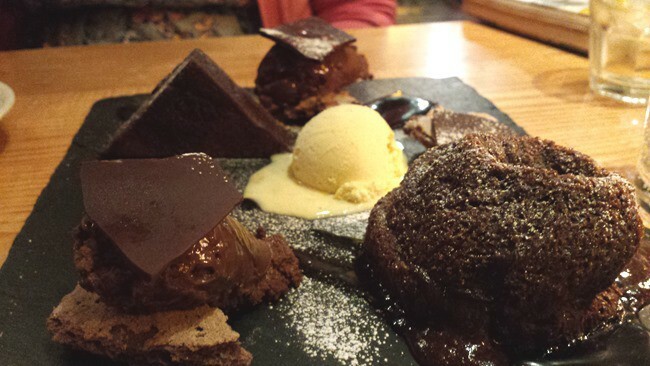 It was DIVINE I tell you, I had to stop myself from licking the slate clean once we’d scooped up all we could with our spoons. 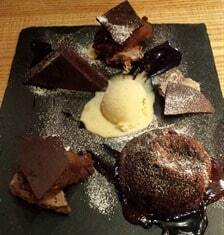 I think the molten middle pudding was my favourite, but the brownie was also pretty special. It certainly went down a treat on instagram when I shared it! As Karina was driving and I’m pregnant we stuck to soft drinks sadly, but my hot ginger beer had a little kick to it so that it almost tasted alcoholic! Karina had a strawberry, apple and elderflower juice which was so nice that I ordered one when I finished my first drink. When I was dining there for a friends hen do a couple of years ago I remember hitting up the cocktail menu with a bit of force, they have some really awesome concoctions, but do non alcoholic ones too! As always the service was spot on, even with every table taken which is impressive in itself for a wet and windy Wednesday evening! I’ve written about Food for friends before, for afternoon tea and also here. I was also really pleased to hear that Food for Friends is also launching a digital version of their sell-out cookbook soon, you can find more info about that here, and there are some recipes on their website to try out at home too. For a restaurant that has been around since before I was born (established in 1981!) it certainly knows how to keep up with the times! My meal was subsidised but my opinions remains honest and unbiased. Sunday Scrapbook – Getting back into the swing of things!